Origami (pronounced or-i-GA-me) is a Japanese word that means “to fold paper” and is known as the Japanese art of folding paper into shapes representing objects. Paper folding has been practiced for thousands of years, first beginning between AD 100–200 in China. But even though origami began in China, it didn’t become widely popular until the Japanese took a liking to it in AD 600. In the beginning, when paper was first invented & was expensive, origami was used for religious occasions such as weddings & Chinese tea ceremonies. But today, origami can be found in all types of settings, such as schools, churches, art galleries, and museums. I hope you enjoy folding the designs in this book, which come from stories in the Book of Mormon, LDS Church history, and modern-day temples. 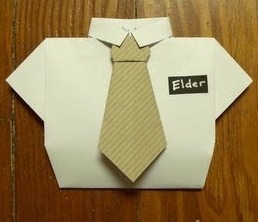 Just glue the tie onto the shirt and then draw on a missionary badge if you like! Click to page 2 and page 3 of this article for more Mormon origami projects, or check out Mormon Origami and More Mormon Origami by Todd Huisken.